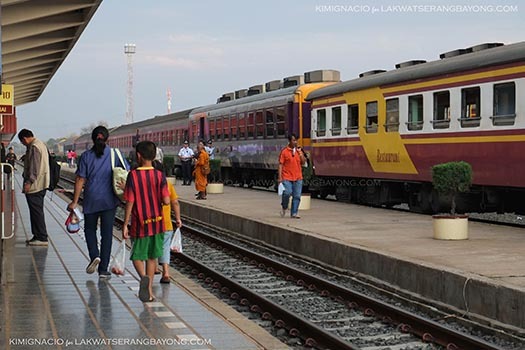 Train travel from Bangkok to Vientiane is comfortable, cheap and pretty straightforward. 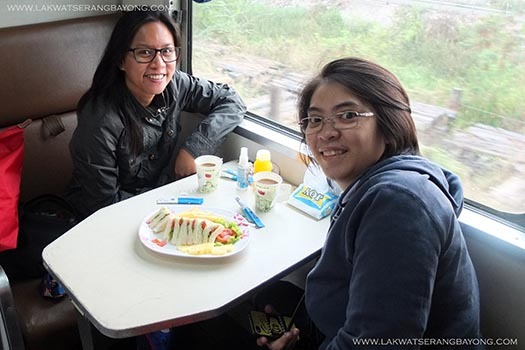 We love train travels and would take it over other forms of transport if it’s a viable option and time allows. For our train travel planning, we always refer to the man in www.seat61.com. 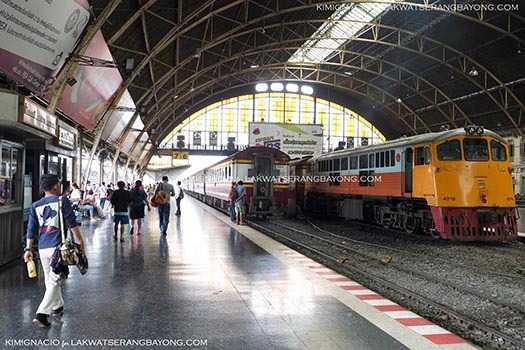 We bought our train tickets at Bangkok Railway Station also known as Hua Lamphong Train Station the morning of our travel. We had no problem getting our preferred lower and upper berths at a 2nd class overnight sleeper carriage leaving that night at 8 PM but pre-book if you can. Ticket cost was only $23 per person and you get your own lie-flat bed, freshly laundered blanket and pillows, and a curtain for privacy. 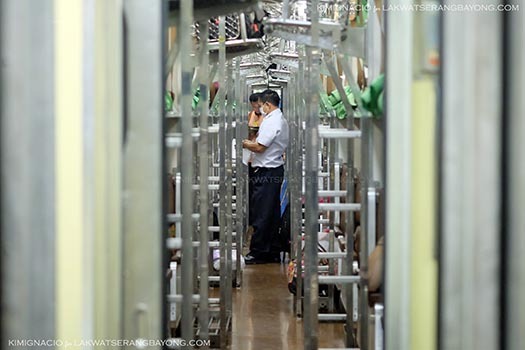 There’s also a restaurant car and waiters move around to take your food order and bring it to your compartment. 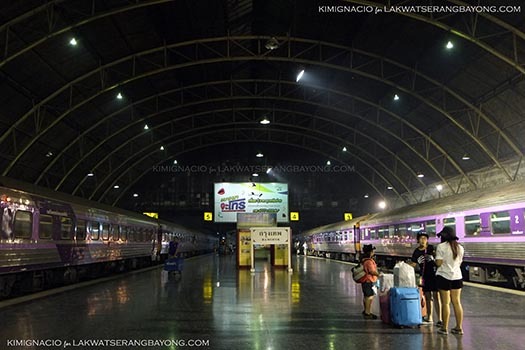 We were at the station an hour before the scheduled departure and found our car in train 69 with no difficulty. The place is clearly sign posted in Thai and English and stewards abound and are eager to assist. The station has several stores selling food and drinks, a waiting area with plastic seats cooled by fans and a bookstore and restrooms. We boarded at Platform 5 and settled in our seats and a few minutes after 8, we began moving along. Before 10 PM, our seats were converted into beds and I climbed into my upper bunk while Kim occupied the lower bunk. If you plan on sleeping early, it may be possible to request the on board attendant to set-up the sleeper beds immediately after getting on. There were toilets and sinks at the end of each car. We always have our own toilet paper stash and hand soap but they were also provided. 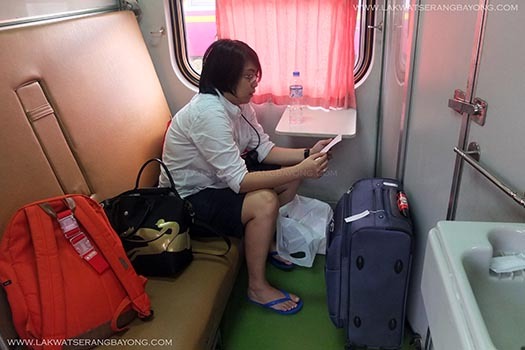 There’s a space for your luggage under the bed or at the luggage rack. For our peace of mind, our bags were secured with locks and chained into the metal post. We woke up with the sun and breakfasted on sandwich, coffee and fruit juice on board, preordered the night before. 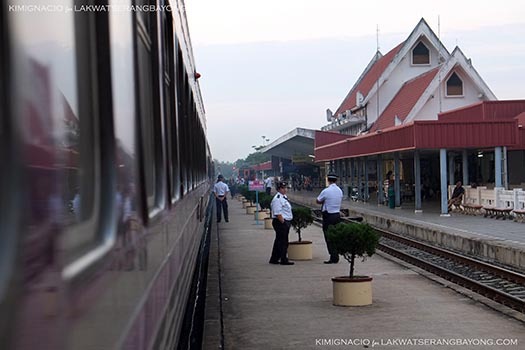 After 12 hours, at 8 in the morning we slowed down to a stop at Nong Khai train station, still in Thailand. 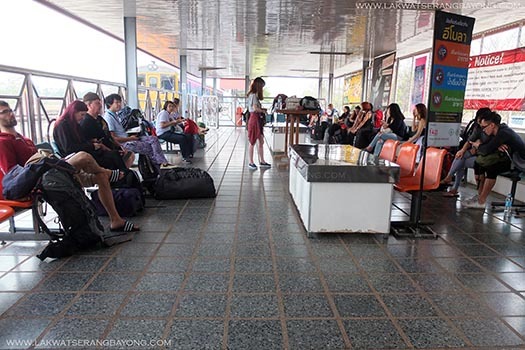 After getting our Thailand exit stamps, we waited a few minutes at Nong Khai station to transfer to a shuttle to cross the Friendship Bridge and bring us to Thanaleng on the Laos side of the Bridge some 13 km from Vientiane, the city center and capital of Laos. Shuttle ride was 40 baht per person. 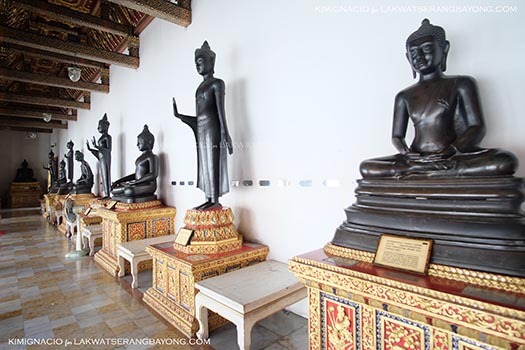 Philippine passport holders can enter Laos visa free for a 30 day stay but an entry and exit fee of 40 baht is required. After getting our passports stamped in, we took a 45-minute mini van ride for 600 baht to deliver us to our hotel. Going back to Bangkok is basically the same process just done on reverse. 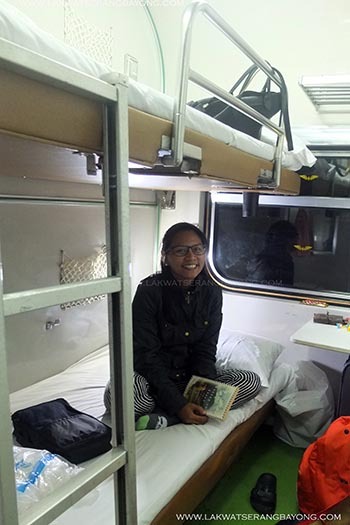 This time, we took the first class sleeper train. 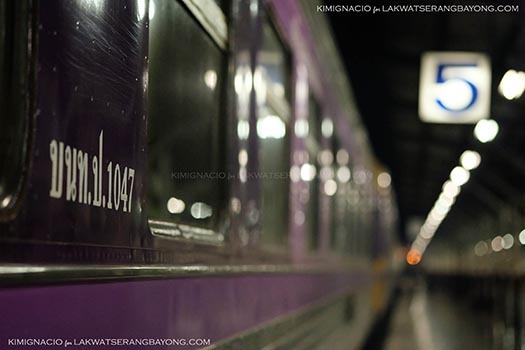 We were held up at the long immigration line and showed up at the ticket window in Nong Khai station already minutes late before the scheduled departure of 710 PM but it was just our luck that our desired first class sleeper cabins are still available. 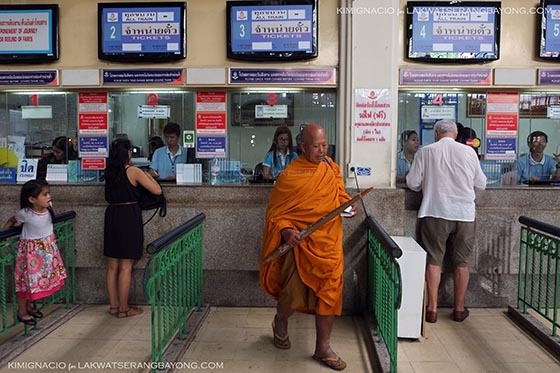 We purchased our train tickets for 1,250 baht per person, paid for in Baht and in cash. Expected time of arrival in Thailand’s capital is at 6 am the next day. For a negligible total difference cost of about $30 for 2, our cabin came with more privacy with a solid door that we could lock and our own in room sink. There’s a dedicated light switch that we can turn on and off at will and aircon controls to adjust the cabin temperature. The toilet at the end of our car has a shower and cleaner compared to the one at the 2nd class. Between Kim and I, we’ve been to Bangkok 6 times but we want to keep coming back for more because we don’t run out of things to see and do. And eat! 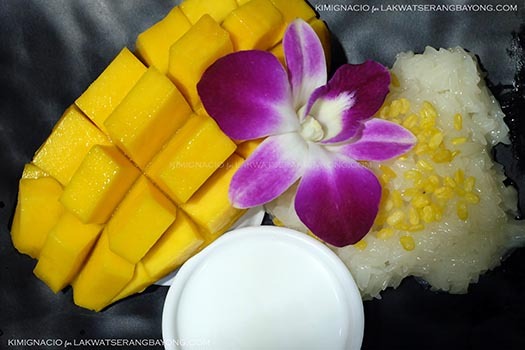 Food is plentiful and delicious, shopping is abundant and cheap and the culture rich if you venture out of the uber touristy Khao San. It’s good to revisit places because then you are not too focused and rushing on the must see sights and can just absorb, really experience and appreciate the real nuisance of the place. On this trip, aside from stuffing our faces with glorious Thai food (more on that later), we even get to participate in their custom. Tak bat or monk's alms collection is a tradition where monks walk barefoot around the village to collect food donation for their daily meal. A monk does not openly ask. They quietly walk the streets awaiting a donor to come to them which allows the donor to give freely and only what they can afford to provide. 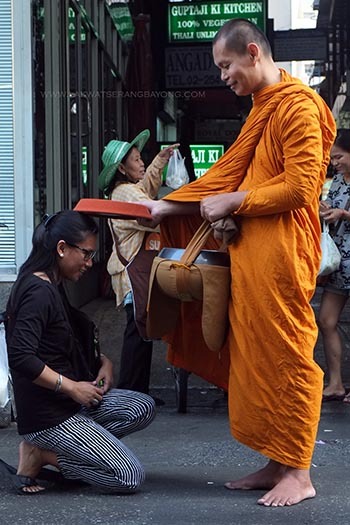 In return for the people's generosity, the monk blesses them. Although there’s a language barrier, I had goosies during the chant! I also got to try my hand at this 200 year old tradition of crafting monk's bowls for tak bat at the Baan Bat or Monks bowl village. A bowl is constructed from metal slabs, hammered by hand and heated to take shape. A small bowl takes 3 long and laborious days to make. 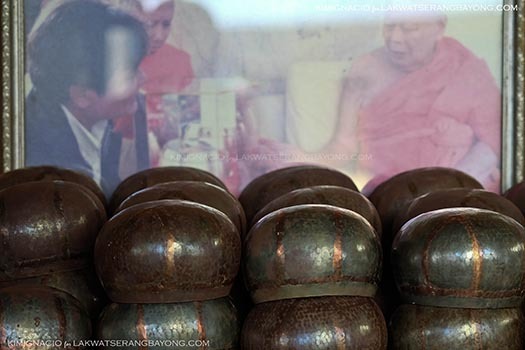 The polished bowls are purchased by the faithful and donated to monks. 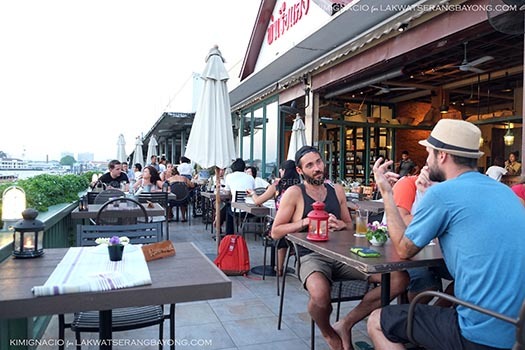 Located at 71 Soi Baan Bat, this place is not on the usual tourist trail and a bit tricky to find but is a highlight and worth a visit in my book. There were lots of pantomime mimicking pounding and begging before our tuktuk driver understood where we wanted to go. We brought home a souvenir to remember this hundreds of years old tradition by and it now sits prettily on our coffee table to coral our remote controls. 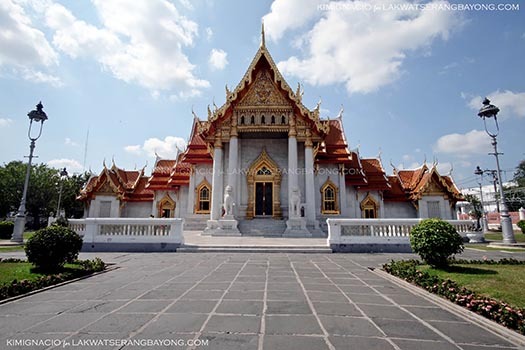 But no matter how many times we visit Bangkok, the trip would not be complete without seeing at least a couple of its temples. Gilded in gold, glittering in the sun with awe-inspiring architecture. These temples are not just tourist attractions but also places of worship so dress appropriately with shoulders and knees covered and footwear off. Most temples are open only until 6 PM. 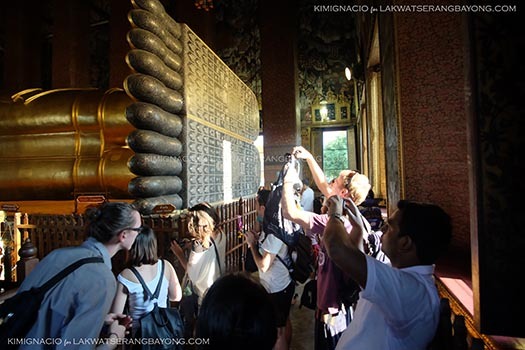 This time, aside from going back to the ever popular Wat Pho, we visited the smaller and lesser frequented temples we missed from our previous trips. 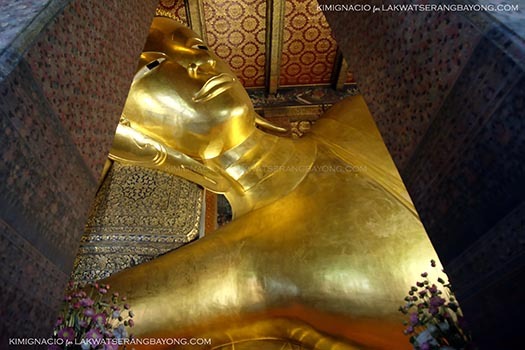 Wat Pho (Temple of the Reclining Buddha). 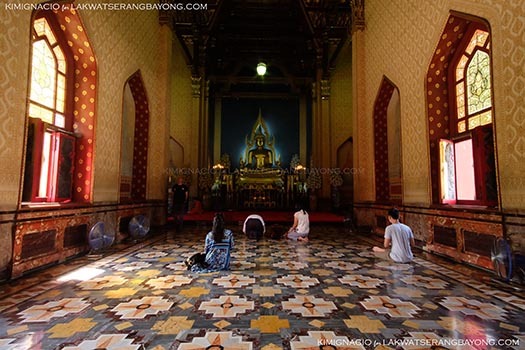 Located at 2 Sanamchai Road at he Rattanakosin district directly adjacent to the Grand Palace. Admission: 100 baht. Wat Benchamabophit (Marble Temple). 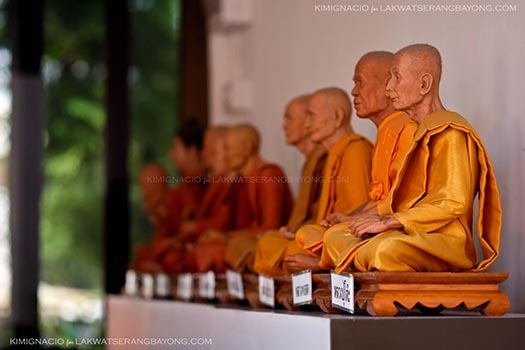 Located at 69 Nakornpathom Road at the corner of Th Si Ayuthaya & Th Phra Ram V in Dusit district. Admission: 20 Baht. 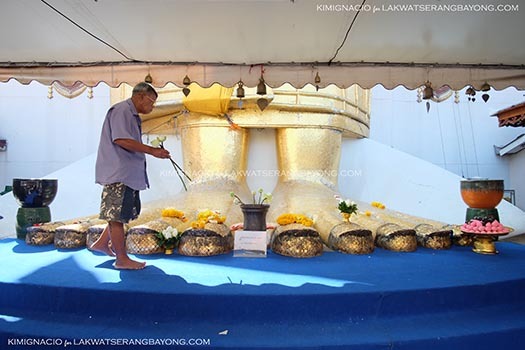 Wat Indrawiharn (Temple of the Standing Buddha). 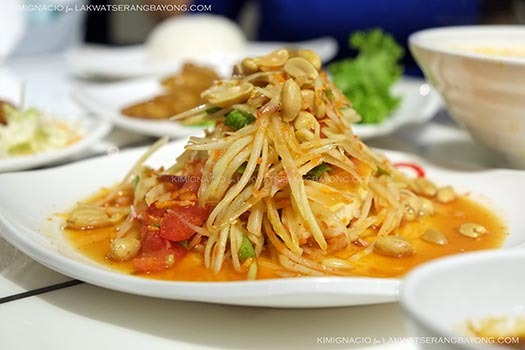 Located at 114 Wisut Kasat Road on the northern edge of Banglamphu in Nakhon district. Free admission. 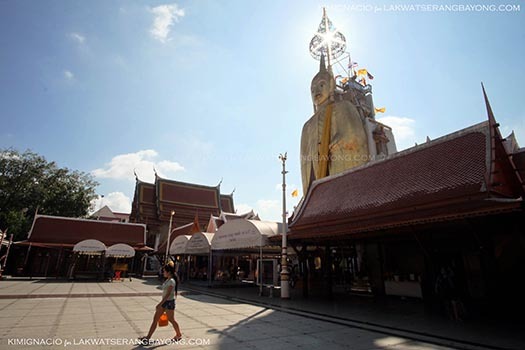 Wat Saket (Temple of the Golden Mount). 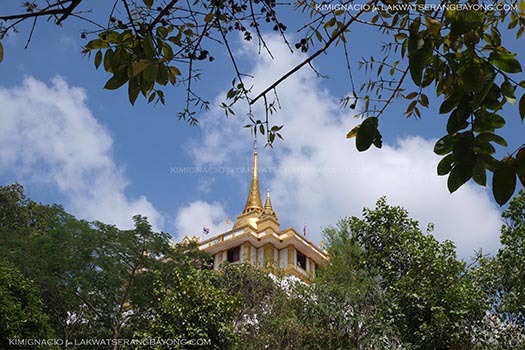 Built on a man made hill located at 1344 Ban Bat in Pom Prap Sattru Phai district. Admission: 20 baht. 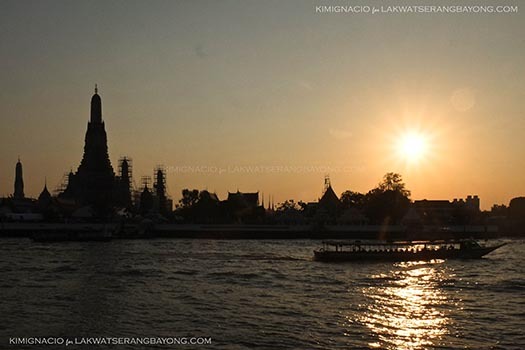 Wat Arun (Temple of the Dawn) was under rehabilitation at the time of our travel (February 2015) so we did not cross Chao Praya river anymore. 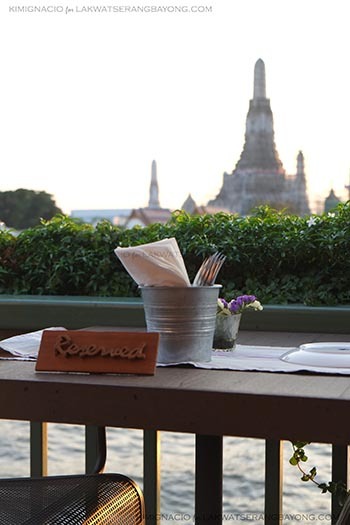 Instead we had a delicious gourmet dinner with wine and cocktails on a restaurant deck by the river fronting Wat Arun as the sun was setting on the horizon. Best to reserve in advance at your chosen riverdeck restaurant so you are guaranteed a table as the place gets packed at sunset. That dinner was a bit pricey by local standards but it was worth it and just too romantic. It was the perfect way to cap off a day of temple hopping and sightseeing. 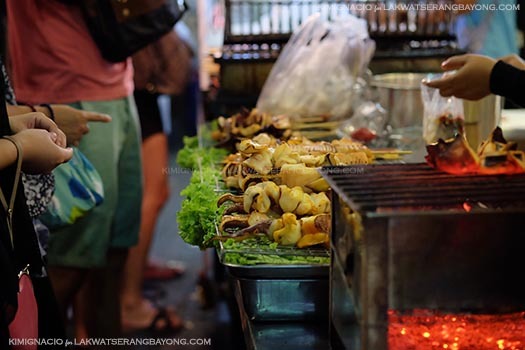 Bangkok ultimately is a cheap place to visit and indulge in the local cuisine even if you are on a budget. 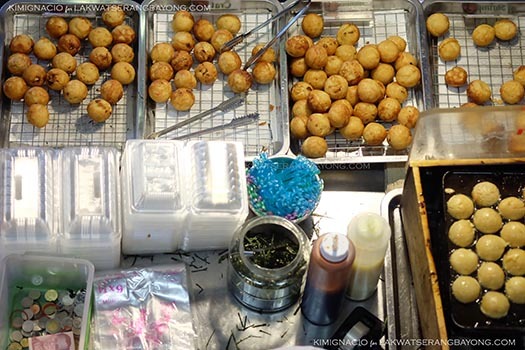 You can just walk on the streets sampling the most flavorful treats and eat until you burst without paying too much. If you have sensitive tummy and or intimidated by street food, you can ease your way in by eating at mall food courts. They are one of the best places to sample a wide variety of tasty cheap eats but in a more hygienic air-conditioned setting. 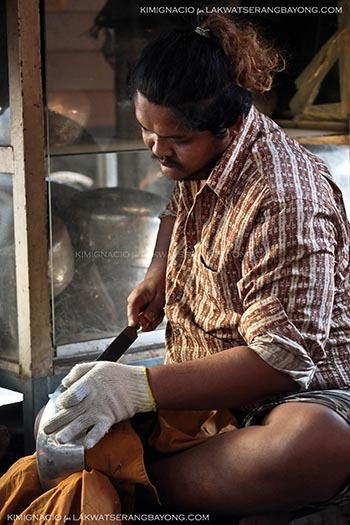 It is also often packed and patronized by locals and not just tourists so you're not missing out on the authenticity. 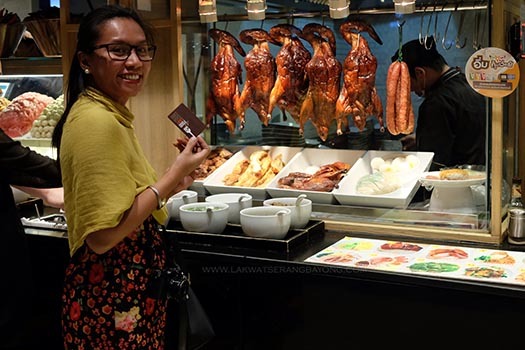 You pick up a cash card or voucher from the cashier loaded with the value you want and then use it to pay at the food stalls. Any unused value can be redeemed when you return the card. 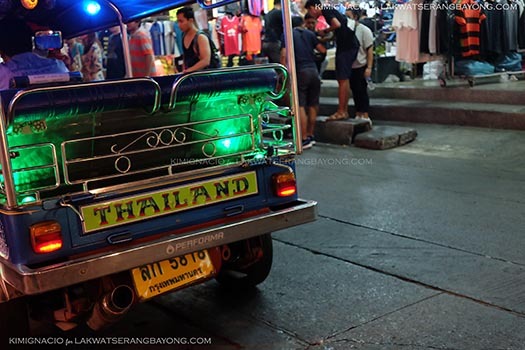 Bangkok, and most part of Thailand is well versed in the art of tourism and perhaps over caters to tourists but that makes it an easy country to travel to and a great value for your travel dollars. Transport tip: The BTS sky train is an excellent way to travel around Bangkok. With 36 stations along 2 lines, it can get you to temples, food and shopping meccas, local markets and tourist places. Another tip: Upon check in when traveling overseas especially in non-English speaking countries, I always grab a hotel's business card so that if ever we get lost, which happens all the time, we have the hotel name and address in the local language to show the driver.